German Beer Stein 3-D character stein dancing wild boar 1 liter tankard, beer mug NEW Length: 31 cm/12.2 inch Width: 12.5 cm/4.9 inch Depth: 17 cm/6.7 inch German Beer Stein 3-D character stein dancing wild boar 1 liter tankard, beer mug This beerstein is handmade in the Kannenbaeckerland, the German pottery and beerstein center. On our about me Site you will find more information about us. 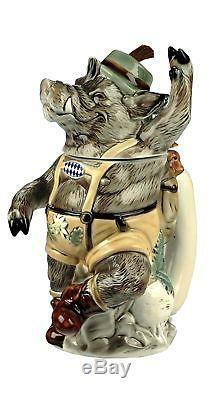 The item "German Beer Stein 3-D character stein dancing wild boar 1 liter. KI 8003 1L NEW" is in sale since Wednesday, January 10, 2018. This item is in the category "Collectibles\Breweriana, Beer\Drinkware, Steins\Lidded Steins\Germany". The seller is "kuckucksuhr-net" and is located in Schönwald. This item can be shipped to North, South, or Latin America, all countries in continental Asia.